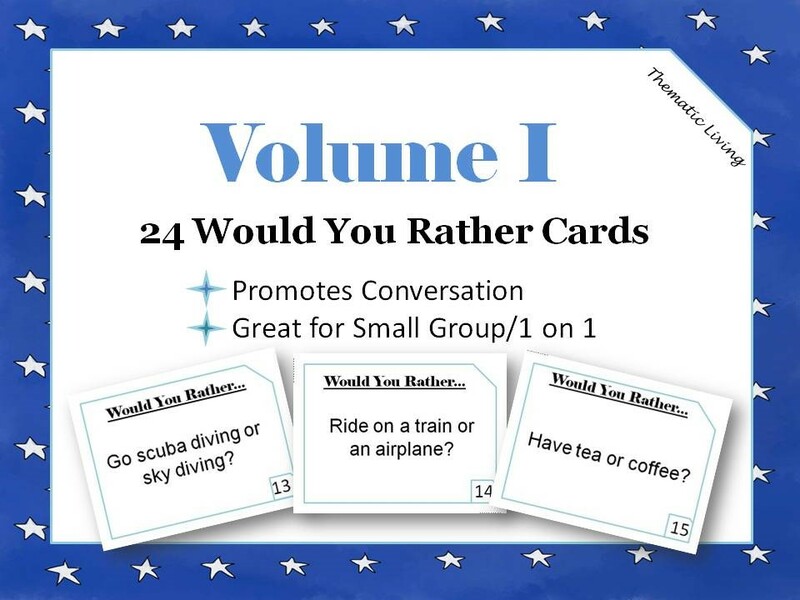 Includes questions, such as "Would You Rather": Go scuba diving or sky diving?, Ride on a train or an airplane?, Have tea or coffee? Would You Rather? helps to strengthen and maintain skills for speaking, listening, reminiscing, critical thinking, communication, storytelling, and imagination. Each card contains large print so that the words are easy to read. Just print on card stock, laminate, and cut to start the fun. You may use a tablet or computer, if printing is not an option to display each card. Depending upon how many people are playing the game one person or each participant can take turns reading what is on each card. Each card allows the participant to express their thoughts and opinions when reminiscing or engaging in meaningful conversations. Extend this activity by asking “why” each person chose the answer that they chose. This extension will give you insight into their thoughts and spark memories of pastimes in many different categories, such as: home life, traveling, preferences, eating, and reason. This activity can be completed by individuals with progressing dementia using some scaffolding and support to the best of their ability.